Major data breaches are happening at an ever accelerating rate. How do you best protect your organization and its data? 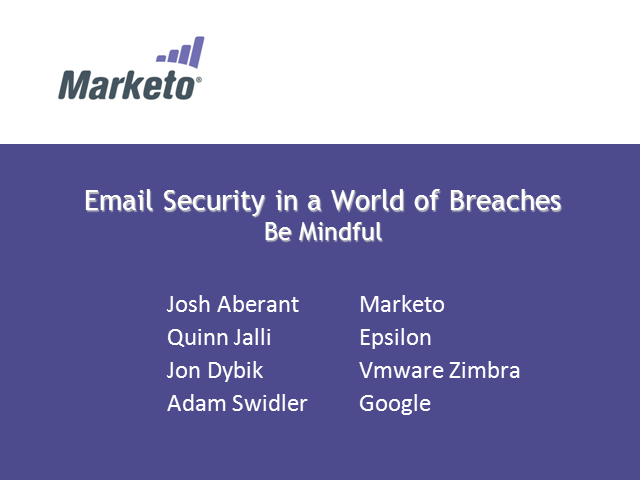 In this panel, major email vendors will discuss security measures that are being taken to avoid breaches and to offer the best protection of corporate emails for its users. The discussion will include different methods that are being used to monitor and control the security of emails that are in transition and archived, new developments that are being implemented to ensure the highest level of security for sensitive personal and corporate data, and tools and technologies that are being used to protect data such as encryption, anti-virus/anti-spam protection, email archiving, e-Discovery and etc. Join us for a discussion on the enterprise solutions of the vendors and examples of how their security features work in a corporate environment.